The 918 Spyder. pictured, is one of three hybrid models Porsche unveiled at the Geneva Motor Show in March. BERLIN (Bloomberg) -- Porsche AG may price the 918 Spyder, which accelerates to 100 kilometers an hour in 3.2 seconds, at $630,000, topping the Carrera GT as its costliest model, according to two people with direct knowledge of the plan. At least 2,000 individuals have put in non-binding expressions of interest for the supercar, said the people, who asked not to be identified because the information is confidential. 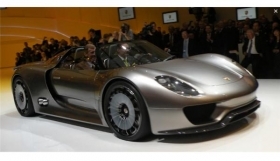 The 918 Spyder is one of three hybrid models Porsche presented at the Geneva auto show in March. Demand for luxury cars is returning as Wall Street firms add jobs for the first time in two years and offer guaranteed payouts to attract top bankers. While Porsche hasn't decided whether and when it will begin production of the model, at that price the 918 Spyder would top the 453,000-euro Carrera GT. Fewer than 1,500 units of that model were built between 2003 and 2006. Porsche, which is merging with Volkswagen AG, needs at least 1,000 sales pledges to approve limited production of the car, development chief Wolfgang Duerheimer said in an April 24 interview. If only half of those who signed up eventually bought the car, Porsche stands to reap 500 million euros in revenue. A Porsche spokesman declined to comment on the potential price tag and said a decision on production of the model will be made later this year. The two-seater car accelerates to a top speed of 320 kilometers (199 miles) per hour, relying on a 500-horsepower V8 engine and electric drive-systems allowing the vehicle to run up to 25 kilometers on electric power. The 918 Spyder emits no more than 70 grams of carbon dioxide per kilometer on fuel consumption of three liters per 100 kilometers, according to Porsche's Web site. Lamborghini SpA, another luxury brand owned by Volkswagen, introduced its Reventon Roadster supercar at the Frankfurt motor show last September. At 1.1 million euros, the Reventon is the priciest model Lamborghini has ever made. Boosting demand for super-luxury cars, average Wall Street bonuses jumped 17 percent to $123,000 last year, New York State Comptroller Thomas DiNapoli said Feb. 23. Morgan Stanley and Citigroup Inc. are among banks that are hiring to replenish their ranks, while Nomura Holdings Inc. and Jefferies Group Inc. have been recruiting talent from larger firms in a bid to increase their standing on Wall Street. In the first six months, BMW AG's Rolls-Royce almost doubled deliveries. Daimler AG's Mercedes- Benz unit increased sales by 22 percent in the U.S. alone. Porsche is promoting the 918 Spyder at a time when VW is seeking to revive the sports-car manufacturer's vehicle lineup. Volkswagen last week named its head of strategy, Matthias Mueller, as chief executive officer of Porsche from Oct. 1, replacing Michael Macht, who will head production at the parent company. Volkswagen CEO Martin Winterkorn said last week Porsche will probably add a new line of smaller Boxster roadsters to its four-model lineup as the manufacturer aims to double sales in the medium term to 150,000 cars and sport-utility vehicles. A further addition may be a compact SUV, smaller than Porsche's best-selling Cayenne model, with production based on the Q5 model of VW's Audi division, the people said. Porsche's deliveries in North America, which includes Canada and Mexico, fell 18 percent to 15,592 units in the nine months through April. Sales in the U.S., Porsche's biggest single market, slumped 40 percent last fiscal year to 19,024 cars and SUVs. Uwe Hueck, Porsche's works council chief, said July 6 that building the 918 Spyder at the main Zuffenhausen plant would help create jobs at the factory where about 5,500 workers are employed. Hueck is aiming to conclude talks with management over investment and employment terms at Zuffenhausen by July 22.